Charcoal - Clings to toxins and pulls impurities from skin for a deep clean and also helps to brighten skin. 7 Sprout Complex - This includes green tea, wheat extract, arugula, spirulina, ginko, broccoli extract and alfalfa. These ingredients are detoxifying and have anti-inflammatory properties. Tea Tree - Cleanses pores and reduces sebum production. 1. Cleanse skin and dry thoroughly. Important: Rub sachet for a few seconds to activate bubbles. 2. Tear open sachet and remove from packaging. 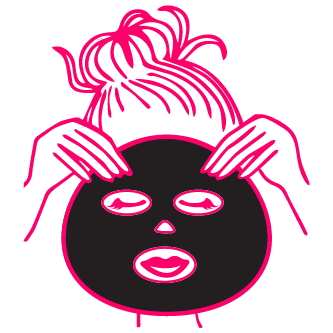 Unfold mask and apply to face, aligning eyes and mouth. 3. Leave on for 5-10 minutes and watch bubbles form. 4. 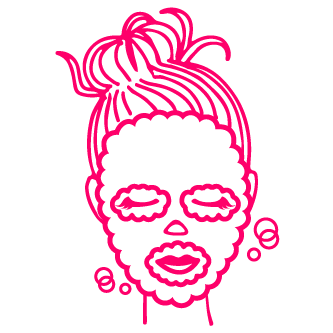 Remove mask and massage excess bubble foam onto skin for an extra cleansing boost. 5. Rinse off with water and pat dry.